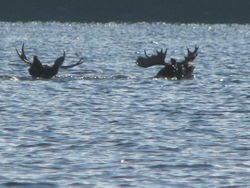 We've established moose love the water, especially in warm weather. Moose lovers, click this link for a special video treat. Hokey warning - the sound track is pretty schmalzsy. Although not a bad song.